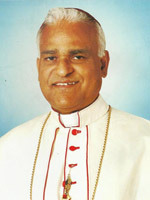 Agra Archdiocese consists of the following districts in Uttar Pradesh: Agra, Aligarh, Auraiya, Budaun, Bulandshahr, Etah, Etawah, Farrukabad, Fathegarh, Firozabad, Gautambudha Nagar, Hathras, Kannauj, Mainpuri, Mathura and in Rajasthan, Bharatpur and Dholpur. The Emperor Akbar, wishing to have some learned Christian priests at his Court, invited the Jesuits from their College at Goa. The first Church work with the Moghul was thus formed by Blessed Rudolf Aquaviva (later a martyr at Goa), Anthony Monserrate and Francis Henriquez, who arrived at the Moghul Court, then at Fatehpur Sikri in 1580. A second and a third Church work followed. The Jesuits enjoyed the patronage of Akbar and his son Jahangir; but under Shah Jehan and Aurangzeb this disappeared. Though there were no Christian congregations of importance in Moghul India, there were a number of individuals who wielded considerable influences in Court and elsewhere. When in 1773 the Jesuits were suppressed, two Carmelite Fathers from Bombay succeeded them in Agra, who in turn, were replaced by the Capuchins after a very short while. By a decree of the Sacred Congregation, dated May 17, 1784, the Vicariate - Apostolic of the Great Moghul was constituted. The history of the Agra Archdiocese under the Capuchins was closely linked with their work in Tibet. Early in 1708, four Capuchins, starting from Kathmandu, reached Lhasa after two months. More Capuchins followed them and took up their residence at Lhasa until April 20, 1745, when, owing to relentless persecution by the Tibetan Priesthood, they had to leave Tibet, and return to Nepal. Thus the capuchin Church work in Lhasa came to an end. But the Church work continued its existence in Nepal until 1768. The whole chain of Capuchin stations, embracing the greater part of North India from Chandernagore to Lhasa, from Sind to Bengal, from the Himalayas to Narbada river, now the Diocese of Ajmer - Jaipur, Allahabad, Indore, Jhansi, Lahore, Lucknow, Meerut, Patna, Varanasi, Delhi, Jalandar, Simla - Chandigarh, Bijnor and Jammu & Kashmir, (formerly Rawalpindi) all came to be known as the Tibet Hindustan Church work. The Cathedrals of Agra, Ajmer, Allahabad, Delhi, Lahore (before the new one), Madras, Patna and Simla, are symbols and monuments of the untiring zeal of the Capuchins for the extension of the faith and the progress of the Catholic Church in India. The prefecture Apostolic of Tibet-Hindustan was in 1820, constituted into the Vicaritae Apostolic of Agra, with Msgr. Maria Zenobio Benucci, ofm cap. as its first Vicar Apostolic, who was succeeded by Msgrs. Anthony Pezzoni and Anthony Borghi.